I have a recipe that will knock your socks off. Raspberry Almond Coffee Cake. It is a decadent but light loaf cake. 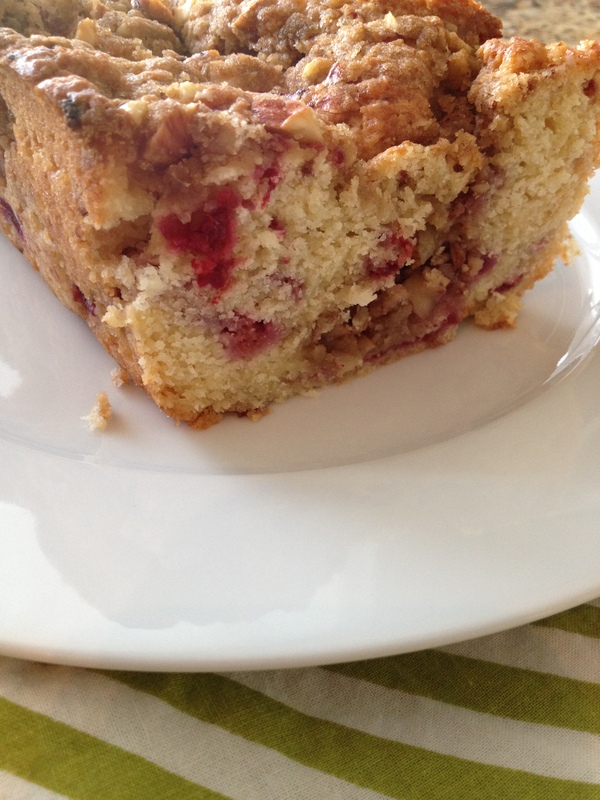 It has a crunchy almond streusel topping and sweet tangy raspberries stirred into the batter. This is an excellent weekend brunch item, hostess gift or a random Tuesday morning treat. I made this for my in-laws a couple weeks back and I’m still thinking about it. I might have to make a few mini loaves for the freezer so I always have some on hand. In another bowl, whisk together the egg, buttermilk and almond extract. Pour over the flour mixture, and stir until just barely combined. Add the frozen berries, and fold in until just mixed through. I started this post out with a very whiny tirade on sick kids who don’t sleep. But nobody wants to hear about that and quite honestly, anybody who’s been in a ten foot radius of me in the last month has heard all about it. So…time for a topic change and hopefully with that, an attitude change! Hurray! I am in love with hand pies. I love pie, but often my crust to fruit ratio is off. Most of the time the filling is runny and the bottom crust is soggy. For me, it’s just tricky. Recipe is HERE. I highly recommend making this dessert with whatever fruit you have on hand. 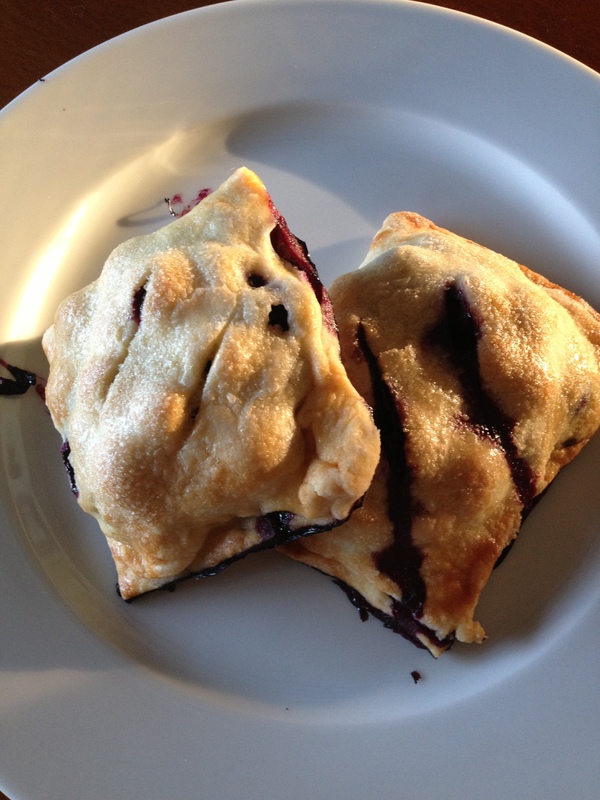 I happened upon some blackberry bushes yesterday and I think I might have some hand pies in my future this weekend. My sad little zucchini plant sat wilted and small in the corner of my garden this year. I almost gave up on the thing until finally in the last couple of weeks, he’s made a comeback. I’ve never met a zucchini plant that didn’t want to grow. That corner of the garden is now taken over by a zucchini plant that’s taller than Luke and pumping out giant squash nearly every day. This means I once again buy flour and sugar in bulk and my oven works its tail off baking zucchini bread almost every day. Last summer I think I ended up storing 20 loaves in my freezer and I’m sure it will happen again this year. My mom’s recipe has always been by far my favorite and yet I never asked her for it. I just waited until she took pity on me and shared what she had made. This year, I finally wised up, got the recipe and now it’s the only recipe I make. Preheat oven to 350 degrees. 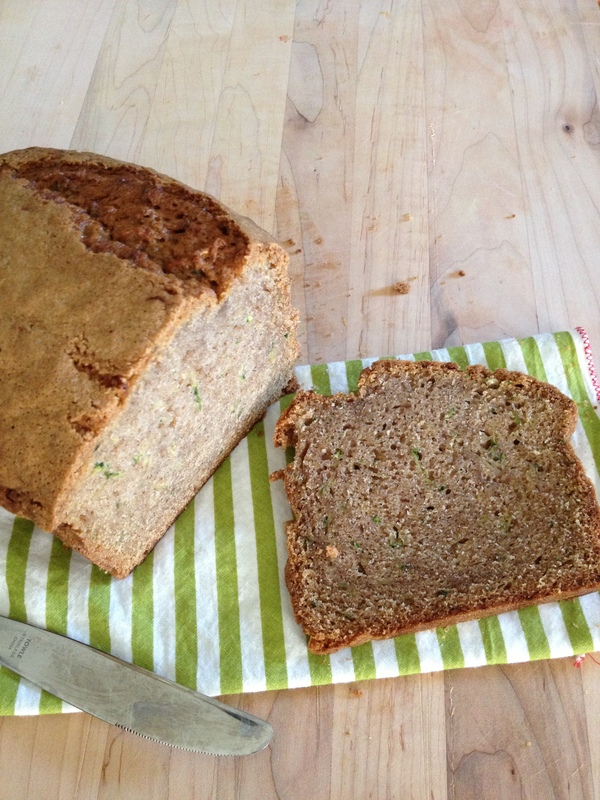 Line bread pan with parchment paper or coat it in cooking spray. Beat eggs and oil for 2-3 minutes until creamy. Add sugar and mix well. Add zucchini and vanilla. In a separate bowl, mix together all dry ingredients. Slowly combine dry ingredients with wet ingredients. Do NOT over mix! Add in chopped walnuts. Pour batter into bread pan and bake for at least one hour, until a toothpick stuck into the center of the bread comes out clean. Bake the bread in ONE large bread pan. I don’t know why, but this makes a difference. The top of the bread forms a slightly crispy crust, making it so delicious. For some reason, when the dough is divided, it doesn’t do this. I typically add an extra 1/2 cup of zucchini. It takes the bread a few extra minutes to cook, but I feel like the bread stays moist an extra day. If the bread is getting too dark on top but it’s not finished cooking, fold a piece of tin foil in half and create a little ‘tent’ to cover the bread. It will continue cooking but the top won’t get overly brown. Add chocolate chips, blueberries or other kinds of nuts. Do NOT add whole wheat flour, flax-seed or bran flakes. This significantly changes the texture and taste of the bread (I tried, I was very sad with the results). It’s a treat, not health food. I’ve seen versions of this desert everywhere from Barefoot Contessa to food blogs to my Martha Stewart cookbook from 1995. The technique is the same and everyone seems to adapt it slightly to make it their own. Preheat the oven to 350 degrees. Grease loaf pan. Sift together the flour, baking powder, and salt into 1 bowl. In another bowl, whisk together the yogurt, 1 cup sugar, the eggs, lemon zest, and vanilla. Slowly whisk the dry ingredients into the wet ingredients. With a rubber spatula, fold the oil into the batter, making sure it’s all incorporated. Pour the batter into the prepared pan and bake for about 50 minutes, or until a cake tester placed in the center of the loaf comes out clean. For the glaze, combine the confectioners’ sugar and lemon juice and pour over the cake. 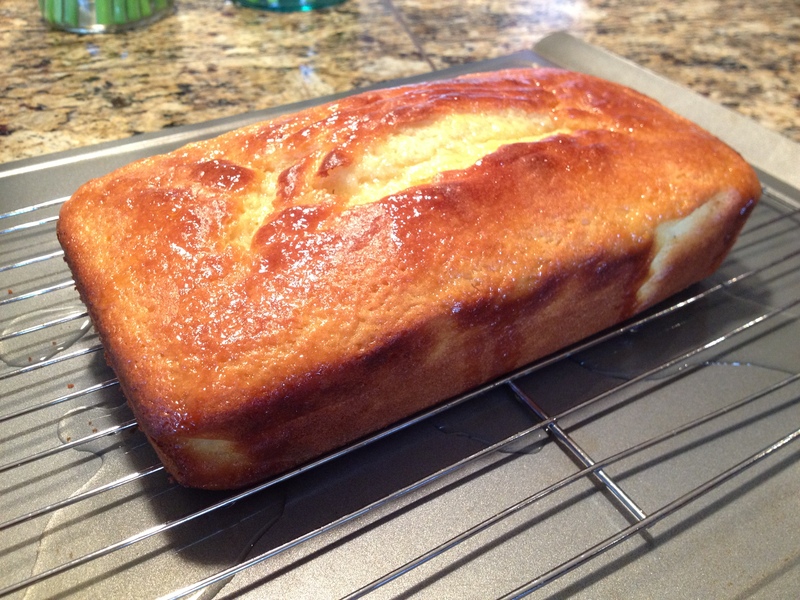 (I typically don’t do the glaze…I don’t think the cake needs the sweetness). Once cooled; slice, top with berries and whip cream and devour. 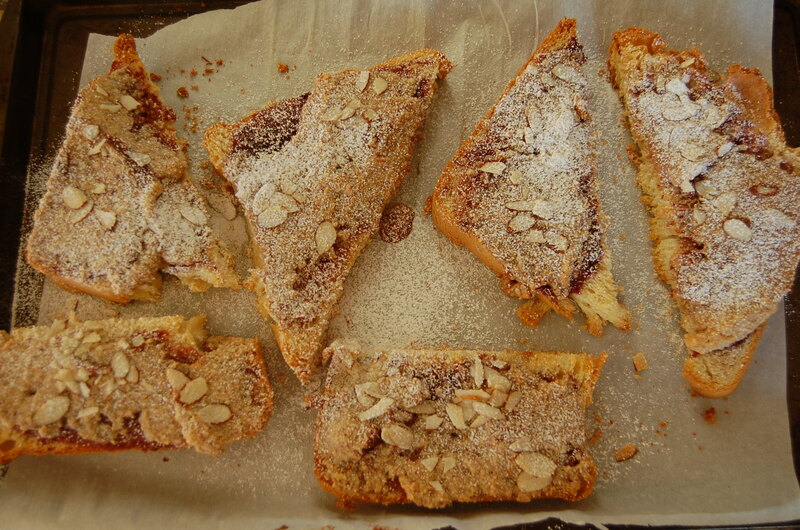 Perusing through the latest Sunset Magazine, I zoned in on this recipe (almond and jam pastry). For two weeks I kept thinking about that recipe, dog-earing the page and reminding myself to buy almonds in the bulk section at the grocery store. On Saturday, Aaron and Jack went skiing, leaving me with two mildly sick little ones who both blessedly took monster naps. This left me twiddling my thumbs and thinking once again about that recipe. 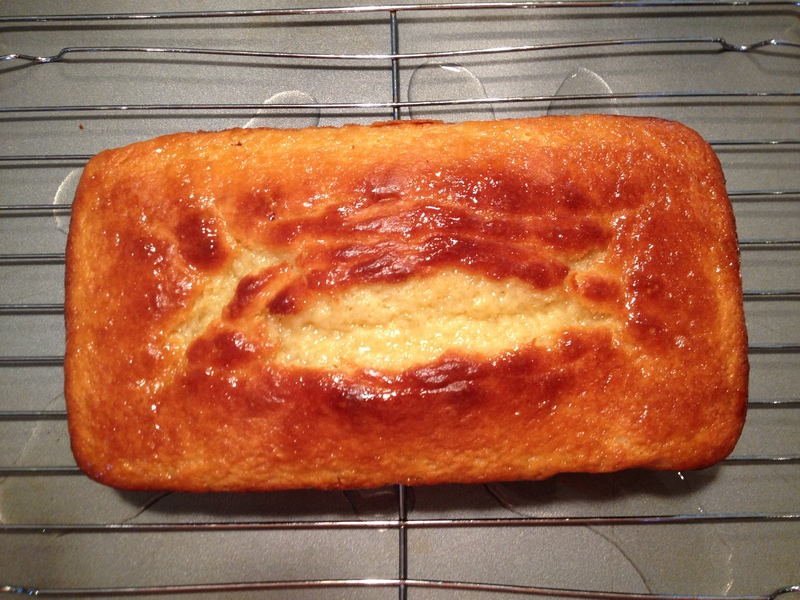 I broke out the bread machine and decided to attempt a loaf of brioche. The stars must have aligned, because the bread baked up beautifully. On Sunday morning, I got up with the kids and after making an extra big pot of coffee, whipped up the rest of the dish. They were so stinking good. The almond flavor and raspberry jam are perfect together. The bread was soft in the middle and toasted on the outside. Sweet and creamy and satisfying without being overly-sweet. The great thing is there’s plenty of almond paste (cream?) left over. So you can make it again the next day (like me), and the next day after that. You certainly don’t need to make the brioche yourself and frankly I think a loaf of french bread would work just as well. I’m thinking about slathering that stuff on my boring old wheat toast tomorrow morning. It took about six months but I finally figured out how to make bread. Actually, let me clarify, I can make one type of bread, a french baguette. I mix the dough in my bread machine and then bake it in the oven. After many many bags of flour and many more packets of yeast, I had accepted that for whatever reason, me and bread, just weren’t going to work out. 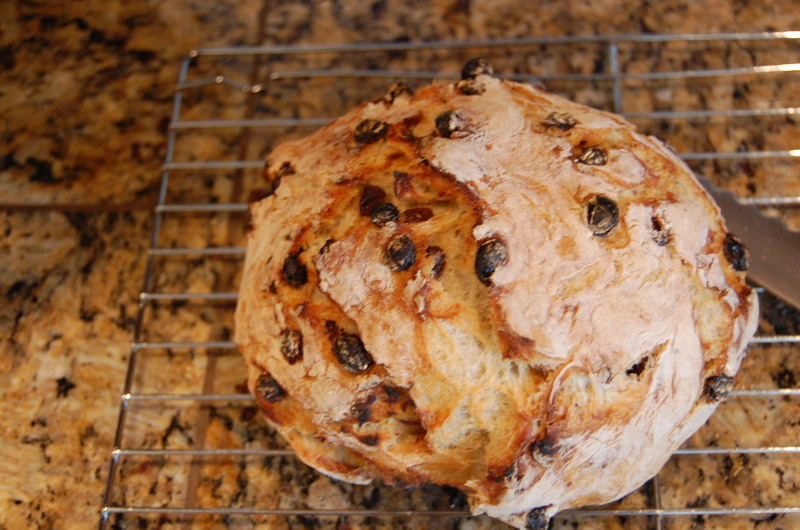 But then…I stumbled on a recipe where you bake bread in a dutch oven. I couldn’t resist, considering I just got my new purple pot, and I’ll take any excuse to use it. And besides, the recipe really did look fairly easy, so I thought I would give it a shot. I can now make two kinds of bread! You should try this recipe. It really is SO easy, and you can mix in whatever you like. 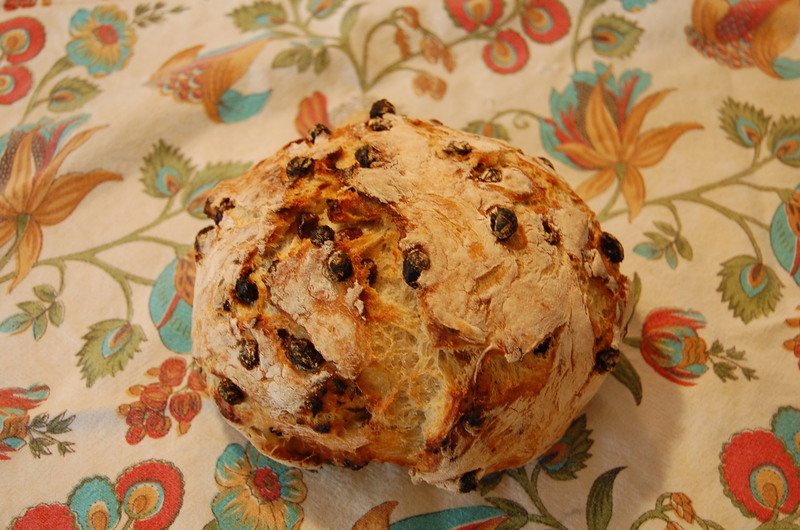 I’ve made parmesean and rosemary, cinnamon raisin and cranberry, orange and slivered almond. Growing up, my mom worked part-time as a registered nurse. She worked a 3-11pm shift and on the nights she worked she left the house before we came home from school. In her absence, she often left a batch of homemade cookies on the counter (and a list of jobs) for us. Usually chocolate chip, sometimes snicker doodle, every once in a while oatmeal raisin. And so, because of how I grew up, or just that my sugar addiction is really that strong, we very often have fresh cookies around the house. Bad I know, but I just can’t help myself. 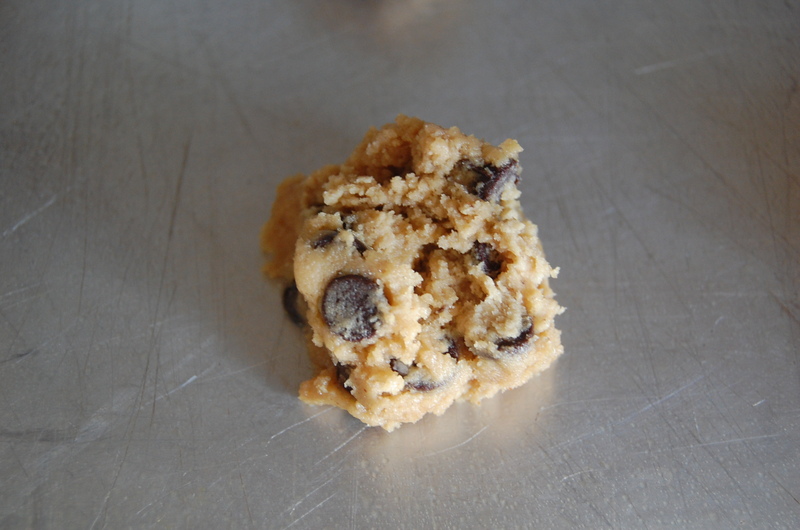 The following recipe is hands down the best peanut butter cookie recipe I’ve stumbled upon yet. They are soft and chewy with a wonderful peanut butter taste, not to mention chocolaty with a hint of saltiness. Perfection I tell you. 1.In a large bowl, combine flour, baking soda, baking powder and the salt. Set aside. 2.With an electric mixer, mix softened butter and peanut butter together until thoroughly blended. Add the sugars and beat until smooth. Next beat in the egg, honey, vanilla, and yogurt until combined. Add the dry ingredients slowly and beat on low-speed just until combined. Gently stir in the chocolate chips. Chill dough in refrigerator for at least 30 minutes-1 hour, or place in freezer for 20 minutes. 3.Preheat oven to 350 degrees F.
4.Once ready to bake, roll dough into 1-inch balls and place onto ungreased cookie sheet. Bake for 9-12 minutes (depends on size of your cookie) or until cookies begin to turn a tiny golden brown and crisp up around the edges. Do not overbake! 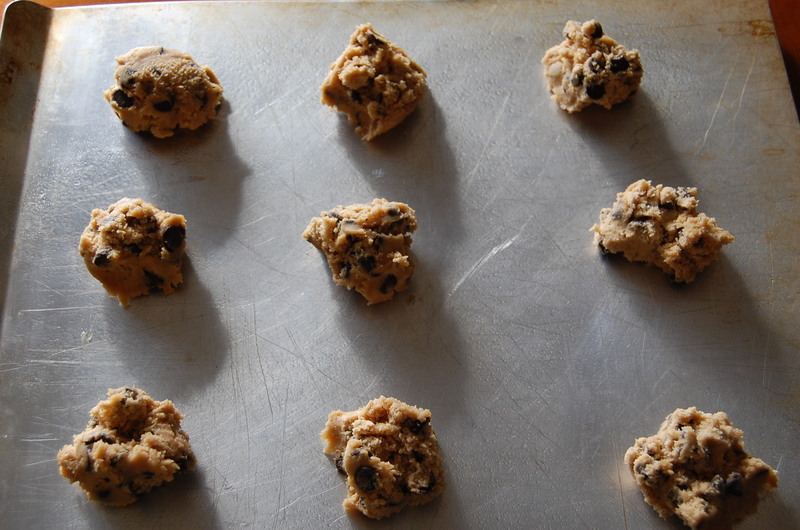 Remove from oven and let cool on cookie sheet for 3-5 minutes and sprinkle cookies generously with sea salt. Transfer to wire rack to cool completely. (cookies will appear slightly underdone in the middle, but firm up as they cool). I freeze cookie dough balls and bake a couple at a time. In theory, this would help us to have moderation, but in reality Aaron sneaks the dough directly from the freezer and I often bake two after lunch and a few after dinner as well. It would be a lie to say I share with my children. Clearly, we have a problem.